The shooting of a mentally ill man by a German special police unit, and his subsequent media vilification, echoes the deaths of vulnerable groups at the hands of the police in the UK and elsewhere. Emrah Kara lived at home with his mother in Holzminden, a small city in the German state of Lower Saxony. Emrah had been suffering from schizophrenia for some time and had been taking medication to manage its effects. He had recently gone off his medication and his behaviour changed. The change had become difficult for him to cope with. Emrah was in need of help. On 20 December 2013, while at home, Emrah had an episode in which he became volatile, took hold of a knife and would not let anyone close to him, so his family called a doctor and then the police. The police in turn called the SEK (special command unit), and a member of this unit shot 29-year-old Emrah through the chest, killing him. Coverage of this incident has been scant, with only a few German and Turkish papers reporting on it. Germany’s Bild newspaper, a mainstream national news source, went to some lengths to present Emrah as the assailant in this situation. The title of its online article on the event was ‘SEK shoots man on a rampage’ and the subtitle read, ‘before, he had knifed down a police dog’. The photo with the article was of the adorable special command unit dog, and the caption informed the reader that the dog was in a coma, and it is unclear as to whether it would survive the ‘attack’. The SEK apparently sent the dog into the room with Emrah to intimidate him into calming down, when they should have known that he was suffering from a particularly profound mental condition—at which point the question of whether Emrah or the SEK had ultimate responsibility for the welfare of the dog becomes a merely rhetorical one. But this type of coverage does a great deal to portray Emrah as a heartless person on a murderous rampage rather than to take on the serious responsibility of journalism to balance reality with such sensationalist impulses. Nowhere in the article was Emrah’s schizophrenia mentioned. Emrah has been called an attacker by the media and a victim by community members, but it may be helpful to reframe the discussion in terms of power and responsibility instead of the neat binary of victim-perpetrator. This reframing enables us to dissect what could have been done differently and which party or parties would have had the responsibility and ability to undertake this different course of action. To this end, one must acknowledge the enormous power imbalance that existed between the parties. One party is a heavily-armed and specialist-trained five-person police unit, the other is a family that has called the police for help, one of whose members has a mental condition that profoundly affects his behaviour and his ability to appreciate violence and danger. 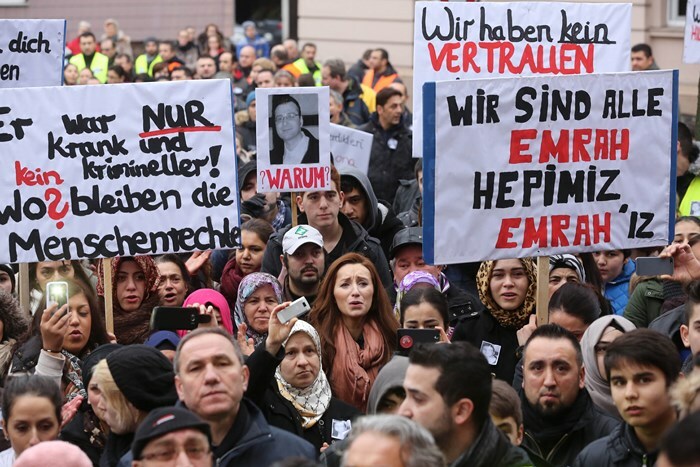 At the end of December, over 1,000 people filled the streets of Holzminden, both to peacefully remember young Emrah and to express their outrage at the circumstances surrounding his death. The demonstration, organised by DITIB-Gemeinde Holzminden (Turkish-Islamic Parish of Holzminden), began with a march from the ce ntral train station and ended with a series of speeches held by organisers, a doctor, and a neighbour of Emrah on the steps of the police station. It was clear to the demonstrators assembled there that the response of the special command unit to Emrah’s episode was disproportionate. The question for many was: how could this have happened? ‘With this event,’ explained demonstration organiser Ümüt Bayer, on behalf of the DITIP-Gemeinde Holzminden, to a member of the WDR news, ‘we wanted to do justice for Emrah, not having to just accept his death. It can be Emrah this time, a few days later it can be someone else, and so on. It was not about nationality, religion, etc., but rather about the fact that a person has died in this manner.’ This statement puts the community’s response into perspective—that, while the issue can not be reduced to nationality or religion, for example, there is a systemic aspect to what occurred—which includes disproportionate response on the part of law enforcement, exacerbated by a failure to consider the totality of the person’s circumstances, including his known mental condition. Emrah was buried in his hometown of Amasya in Turkey, where his uncle promised to follow the case and publicly expressed a desire for support from the German Minister for Migration, Refugees and Integration. There is a sense among some that not only was Emrah shot because he was seen to be violent, and not only did the special command unit act without due regard to the fact that he had a serious mental condition, but that the reaction of the unit, as is not uncommon in German society, was filtered through the lens of Emrah’s profile as a young, fit male of Turkish descent. 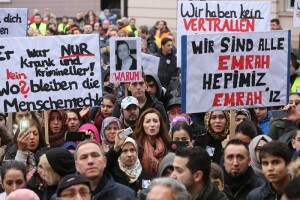 A medical doctor from Koblenz, who gave a speech at the demonstration, opined that Emrah must have had an acute expression of his condition, in which case, he argued, the police should have helped Emrah procure emergency medical attention. ‘I find it unexplainable, unbelievable, that a dog is set upon a patient … and then ultimately the SEK shoots this mentally ill person,’ he says. ‘That cannot be, and that is why we are here.’ He insists that there must have been a way to disarm Emrah without killing him, and that, to his understanding, the SEK is specially trained to deal with difficult situations such as this. Institutions and structures: what can be done? People with mental conditions are not infrequently the recipients of disproportionate violence at the hands of law enforcement agents. In the UK, we saw this with the 2008 death of a man with schizophrenia named Sean Rigg, when the police used ‘unsuitable force’, the investigation of which was critically examined in a report last year. In 2013, a man with a severe mental disturbance that causes him to experience intense chronic pain, incarcerated in a prison in Stadelheim, had been engaging in self-harm and injured an officer who tried to stop him. The officer filed a legal suit for the injury against the man, who was wheeled into the courtroom on a gurney in a dressing gown, the image of which articulates the absurdity of the entire situation. In 2011, Christy Schwundeck, who had been treated for depression, was in a dispute with a job centre employee over payment of her funds. The police were called and, as Christy had a knife and was defending herself against the officers, they shot her in the stomach, killing her. They subsequently argued that they feared grave injuries and that there was no other way. As in Schwundeck’s case and in the case of other acts of police abuse or disproportionate responses to perceived threats, when such perceived threat is posed by a person who is seen as ‘different’ to the typical German (whether for reasons of imputed race, ethnicity, belief, gender, etc. ), it is unimaginable that the difference does not influence perceptions of danger, relative threat, and the appropriateness of response. Thinking specifically about the state of racial and ethnic relations in Germany, and particularly around anti-Muslim and anti-Black stereotypes, it is important to ask ourselves to what extent such fears inform the judgement of police, as well as prosecutors. While the police in Holzminden are currently investigating Emrah’s death, it is important to note that Germany, unlike the United Kingdom, does not have a mandatory coroner’s inquest system or an independent police oversight committee. The police investigation will, therefore, not be a public process and will not involve a jury comprised of members of the community. All translations from the original German are the author’s. According to DITIB-Gemeinde Holzminden, there were actually between 12 and 15 SEK officers present at the time of the incident, not five. This is tragic and unfortunatley a reality world wide. Mirrors the case of Roger Sylvester in the UK. In Roger’s case the unlawful killing was later overturn by the 8 officers responsible for his death. My heartfelt sympathies goes out to the family.